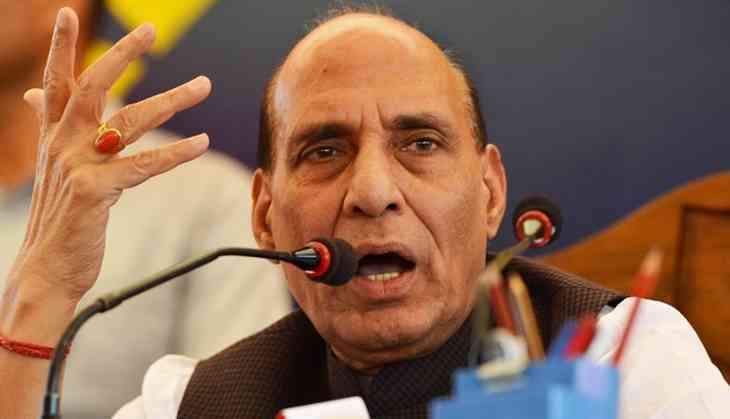 Home » Politics » What is BJP and Rajnath Singh’s 'permanent resolution' for the Kashmir issue? BJP has an extreme integrationist view on Kashmir. What does it mean by “permanent resolution”? Over the past two weeks, Home Minister Rajnath Singh has made several curious statements about the government’s plans for a “permanent resolution” of the Kashmir issue. In one of the earlier statements, he cryptically remarked that the government has indeed “come up with a permanent solution to solve Kashmir”. He continued that “the initiative has begun” and the government is “moving forward”. Subsequently, he repeated the statement again and added that the government will “take people into confidence” about the solution. Although Singh has given no details about the solution being envisaged, he did define its limits. He made it clear that the solution won't allow any compromise over the territorial integrity of India - an iteration of the long-standing position taken by the Indian government, one which could have well been taken for granted. But what is this “permanent solution”? Singh has let on nothing to give people even a vague sense of where we are heading. Yes, he has stipulated no compromise on territorial integrity. And another important remark that he has made and repeated in the context of the talk of solutions is that not only Kashmir, but “Kashmiris and Kashmiriyat” too belong to India. The statements have generated simultaneous interest and anxiety in Kashmir, if not the rest of the country. There is interest as the BJP, with its extreme integrationist agenda on Kashmir, is talking about a permanent solution, which is seen as an indirect acknowledgement of a problem in the state - something the BJP normally denies exists. More so, there is anxiety as no one is sure about the party’s intention to adopt a political approach towards the turmoil in the state and work towards a political resolution. And understandably so - in the three years that this government has been in power, there has been no political outreach towards Kashmir. The government’s response has been invariably militaristic in nature. The language has become abrasive. Nuance has given way to a literal reading of the situation. Careful diplomatic talk has been replaced by hurling of threats and abuses. Faces have frowned and expressions have become menacing. This realisation prematurely kills any excitement over Singh’s talk of a resolution. So what is the Home Minister really talking about? Is he talking about a resolution in a matter-of-fact manner, meaning nothing more than a stabilisation of the situation? This could mean tougher security measures to quell the protests and stone throwing; a scorched earth policy to crush the militancy; action against the alleged sources of militant funding or even a plan perhaps to eliminate active local and foreign militants over a specific period of time. And by backing it up with an unyielding political stance, something those in th Valley see as the brainchild of National Security Advisor Ajit Doval. The Doval Doctrine, as it is popularly called, frames Delhi’s prevailing give-no-quarter policy for the Valley. The contours of this policy are gleaned from a long speech on Kashmir that Doval gave in 2010. Its larger message is summed up like this: The Valley’s descent into turmoil is self-containing. The resistance once stretched to its limits will end on its own and lapse into normalcy. More so, when it is largely self-inflicting in its fallout with Kashmiris at the receiving end of the ongoing violence and Hurriyat’s protest schedules. Considering there has been a conspicuous toughening of security measures in the Valley over the past few weeks, one could very well see it as part of the alleged plan for a permanent resolution. But even if the Centre, to a significant extent, achieves its ambitious security objectives in Valley within a specific time frame, it would make little redeeming difference to the state of affairs. It won’t be long before the situation lapses into uncertainty. But we can hardly presume that New Delhi is not aware of this reality. Hence a “permanent solution” will call for something more, for example, an initiative or a plan which if carried to a logical conclusion has a game-changing potential in security, political or legal terms. One such anticipated measure, which has been a source of deep paranoia in Kashmir, is the Centre’s attempt to revoke or dilute J&K remaining constitutional safeguards to achieve the longstanding Hindutva dream of integrating the state with India. Many even speculate about a bid to undo the Article 370 or one of its critical features like the Article 35A, which protects J&K’s state subject laws whereby outsiders can’t become the state’s citizens. However, as things stand, such a far-reaching legal step will be impossible to accomplish, unless the J&K government also plays along, again an unimaginable proposition. Besides, let alone the actual revocation of the constitutional safeguards and its potential catastrophic fallout, it is the very fear of such a prospect that has become a factor in perpetuating the ongoing turmoil. And as top People’s Democratic Party leader Naeem Akhtar made it clear in an interview, such an attempt will be a redline for the party and will break its coalition with the BJP. The National Conference too will oppose it tooth and nail. Is there any political road map up its sleeve? One can’t really say. So far the BJP under the Prime Minister Narendra Modi has given little indication that it even considers Kashmir an issue that needs a political settlement and has chosen to treat the unrest in the state as a law and order issue to be quelled by the use of force and some development – albeit, more of former than later. But not long ago, the same BJP led government was working towards a bilateral solution with Pakistan along Pervez Musharraf’s four-point formula. It was the former Prime Minister Atal Bihari Vajpayee who had begun the promising negotiations with Musharraf, which were later followed up by the Prime Minister Manmohan Singh. The process had nearly culminated into a Kashmir solution by the end of 2007 when Musharraf’s sudden loss of power and later on the Mumbai attacks aborted it. The proposals unveiled by Musharraf in 2006 had set out a four-stage incremental process for Kashmir resolution. The steps were: identification of the regions in Kashmir for solution, demilitarisation, self governance and a joint management or a consultative mechanism between India and Pakistan on the state. However, there is a lot that has happened since. The dynamics that had made the engagement possible then no longer obtain. Several new factors are at play in the regional geopolitics and in the relations between the two countries that have made it increasingly difficult to resume the peace process. TWEET THIS After Rajnath Singh’s vague words on “permanent resolution”, anxiety grips Kashmir Valley BJP has an extreme integrationist view on Kashmir. What does it mean by “permanent resolution”?